This Sergio Lub style #725 Caduceus handmade copper magnetic bracelet has two rare earth magnets and is made of pure metals. No plating is used and it is Made in USA. It is just a bit wider than 1/4". A great purchase, and not expensive. Very pleased with my purchase. The bracelet is very pretty. I ordered the small, it is a perfect fit. I also like it, because it is shiny. The order came 1 day earlier then they told me it would, which made me very happy. I have Fibromyalgia, & the bracelet helps with the pain. Thank you Magnet Jewelry Store. his jewelry are beautiful pieces of art that actually help my arthritic wrists also! This bracelet is well made and has a nice weight. My wrist is 7.5 and the large fits just right. The bracelet is a little too shiny for my taste (more than it was pictured). The only reason I didn't rate a 5*. I emailed magnet jewelry to see if there was any way to tone it down. I had a reply within hours with suggestions and even offered to replace it. I definitely agree with all the positive customer service reviews. I emailed Sergio Lub at the same time and have yet to hear back. If I buy again, it will be from you guys! I am very happy with the look and feel of this bracelet and if I have got the size right I am sure the recipient of the gift will be too. I won't know for three weeks, however. Excellent service altogether! I bought this bracelet for my daughter's birthday. She put it on immediately and has not taken it off. She is an adult with a small wrist and was pleased to find a bracelet that actually fit. My wile really likes it and is also good looking . 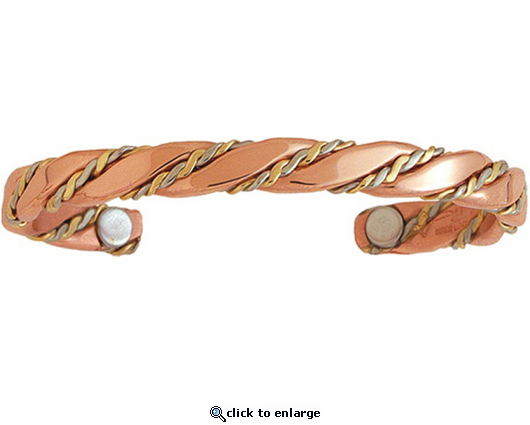 This bracelet is very well crafted; surprised me with how lovely it is. I wear this bracelet to work and play and it really helps my hand arthritis. This bracelet is beautiful and very well made. I will be buying more of Surgio Lub's bracelets. This bracelet was a Christmas gift to my wife both for its beauty and hopefully its healing effects for arthritis in her thumb. She loved it and she actually had improvement. Your service is expedient and great and we especially appreciate the information that came with the bracelet. We're going to give her bracelet a time period for healing and if it works I'll be ordering one for myself. I bought this for my husband - a gift of love for our 7th anniversary! He is a man that has everything and guess what.....he put this on right away along with his other gold bling and is so proud of it.....such a beautiful but manly piece.I would recommend these to anyone....pieces are a work of art. Many thanks for such wonderful quality - I will be back! Really nice product! Very masculine with a good weight to it with awesome quality of craftsmanship. Second time I've ordered from your store. I highly recommend!